At Telfar’s AW18 show, “Music,” there was no runway. Instead, attendees entered the show space to find a stage positioned in the middle of the room, much like the setup of a boxing ring. 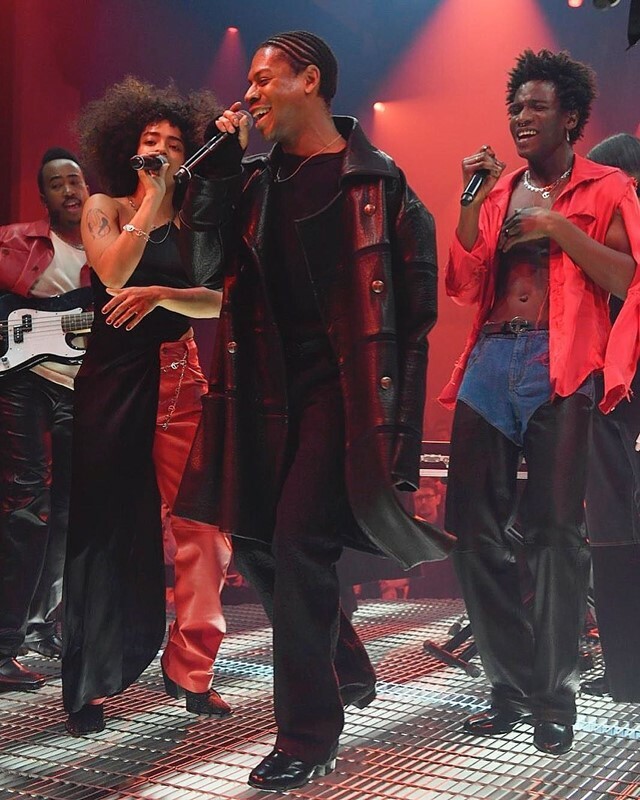 Designer Telfar Clemens elected to present his clothing in the form of a concert, featuring Dev Hynes’ (aka Blood Orange) and Ian Isiah’s adaptation of “Grateful” by gospel singer Hezekiah Walker. Hynes and Isiah directed an outstanding performance, featuring the likes of Kelela, Kelsey Lu, guitarist and singer Bryndon Cook, singer Oyinda, rapper 070 Shake, model-slash-musicians Alton Mason, Arsun Sorrenti (son of Mario) and Adonis Basso, and Midland Agency casting impresario Walter Pearce – who, perhaps unexpectedly, has a great voice. Everyone, even the non-professionals, sounded fantastic, like a chorus of leather-clad nightingales. Hynes came onstage first, playing the keys while bathed in red light. Isiah began to sing in a voice so crystal clear that a non-believer could feel the spirit of the divine – this huge room of jaded fashion people fell silent, awed by what was before them. One by one, Hynes and Isiah were joined by the rest of the performers, who belted and whispered and paced and gracefully danced around the stage, with Isiah’s hook – “Everybody make some noise right now” – inviting the audience to take part. As the show notes stated, “instead of using musicians for their celebrity – we are seeking a core musicality that is shared and human.” These press releases are always hyperbolic, bearing descriptions that have little to do with the shows themselves. This was the rare exception. And while this was the sort of show that induces gasps and causes dozens of grown adults to whisper the word “magic”, Clemens still maintained a sense of humor about it all. For the finale, the designer came onstage to sing his own version of “Grateful”, belting that he was “grateful to my faithful, faithful, faithful customers.” There is no god quite like capitalism. The collection itself, called “Rock” because “it has become so ubiquitous that it signifies nothing” is subject to yet another innovation. From February 12-14, Clemens – who recently won the Vogue Fashion Fund – will be displaying samples at legendary Manhattan consignment store Century 21, or as he calls it, “the final resting place for all fashion.” The public is encouraged to vote on which clothes they want, serving as a guide for buyers and Telfar’s own production. No question about it – this is New York fashion’s first truly democratic brand.